Each CLARINAS~REPETA8S”‘tablet contains 5 mg Loretedine in the tablet coating and 120 mg pseudoephedrine sulfate equally distributed between the tablets coating and the barrier-coated core. The two active components in the coating are quickly liberated; release of the decongestant in the core is delayed for several hours. Inactive ingredients: maize starch, povidone, magnesium stearate. and purified water. Loratadine is a potent long-acting tricyclic antihistamine with selective peripheral H1 – recaptor antagonistic activity. Pseudoephedrine sulfate, one of the naturally occurring alkaloids of Ephedra and an orally administered vasoconstrictor, produces a gradual but sustained decongestant effect facilitating shrinkage of congested mucosa in upper respiratory areas. The mucosa membrane of the respiratory tract is decongested through the action on the sympathetic nerves. congestion, sneezing, rhinorrhea , pruritus and lacrimation. 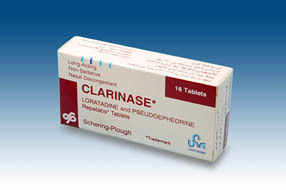 Clarinase Repetabs Tablets are recommended when both the antihistaminic properties of loratadine and the decongestant effect of pseudoephedrine sulfate are desired. Adults and Children 12 years of age and over: One Clarinase Repetabs Tablet twice a day. When administered concomitantly with alcohol, loratadine has no potentiating effect as measured by psychomotorpertormance studies. Increase in plasma concentrations of loratadine have been reported after concomitant use with ketoconazole, erythromycin or cimetidine in controlled clinical trials, but without clinicalluignifrcant changes including electrocardioQ!ae,hic).Other drugs known 10 inhibit hepatic metabolism should be coadministered with caution until definitive interaction studies can be romPleted. pseudoephedrine absorpton; kaolin decreases it. 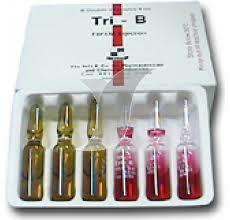 Drug/laboratory Test Interactions.Antihistamines should be discontinued approximately 48 hours prior to skin testing procedures since these drugs may prevent or diminish otherwise positive reactions to dermal reactivity indicators. The in vitro addition of pseudoephedrine to sera containing the cardiac isoenzyme MS of serum creatine phosphokinase progressively inhibits the activity of the enzyme. The inhibition becomes complete over six hours. During controlled clinical studies with the recommended dosage, the incidence of adverse effects associated with Clarinase Repetabs Tablets was comparable to that of placebo, with the exception of insomnia and dry mouth, both of which were commonly reported. Other reported adverse reactions associated with both Clarinase Repetabs Tablets and placebo included headache and somnolence. Rare adverse reactions in decreasing order of frequency included nervousness, dizziness, fatigue, nausea, abdominal distress, anorexia, thirst, tachycardia, pharyngitis, rhinitis, acne, pruritus, rash, urticaria, arthralgia, confusion, dysphonia, hyperkinesia, hypaesthesia, decreased libido, paresthesia, tremor, vertigo, flushing, postural hypotension, increased sweating, eye disorders, earache, tinnitus, taste abnormality, agitation, apathy, aepression, euphoria, paroneiria, increaseaappetite, change in bowel habits, dyspepsia, eructation, hemorrhoids, tongue discoloration, tongue disorder, vomiting, transient abnormal hepatic function dehydration, increases weight, hypertension, palpitation, migraine, bronchospasm, coughing, dyspnea, epistaxis, nasal congestion, sneezing, nasal irritation, dysuria, micturition disorder, nocturia, polyuria, urinary retention, asthenia, back pain, leg cramps, malaise and rigors. During the marketing of loratadine, alopecia, anaphylaxis, and abnormal hepatic function have been reported rarely. Clarinase Repetabs Tablets are contraindicated in those who have shown sensitivity or idiosyncrasy to their components, to adrenergic agents or other drugs of similar chemical structure. Clarinase Repetabs Tablets also are contraindicated in patients receiving MAO inhibitor therapy, or within fourteen days of discontinuing such treatment, and in patients with narrow angle glaucoma, urinary retention, severe hypertension, severe coronary artery disease and hyper thyroidism. stimulants, has been abused. At high doses subjects commonly experience an elevation of mood, decreased appetite and a sense of increased physical energy, mental capacity and alertness. Anxiety, initability and loquacity also have been experienced. With continued use, tolerance develops, the user increases the dose and ultimately toxicity occurs. Depression may follow rapid withdrawal. Safety and efficacy of Clarinase Repetabs Tablets in children younger than 12 years of age have not yet been established. Sale use olClarinase Repetabs Tablets during pregnancy has not been established. Therefore, the product should be used only if the potential benefit justifies the potential risk to the fetus. Since loratadine and pseudoephedrine sulfate are excreted in breast milk, a decision should be made whether to discontinue nursing or to discontinue the use of this product. In the event of overdosage, general symptomatic and supportive treatment should be started immediately and maintained for as long as necessary. Manifestations:They may vary from CNS depression (sedation, apnea, diminished mental alertness, cyanosis, coma, cardiovascular collapse) to stimulation (insomnia, hallucination, tremors or convulsions) to death. Othet.Signs..andsymptoms may be euphcriacexcitement tachycardia, palpitations. thirsLperspjration, nausea,..cllzziness, tinnitus, ataxia, blurred vision and hypertension or hypotension. Stimulation is particularly likely in children, as are atropine-like signs and symptoms (dry mouth, fixed dilated pupils; flushing; hyperthermia, and gastrointestinal symptoms). In large doses sympathomimetics may give rise to giddiness, headache, nausea, vomiting, sweating, thirst, tachycardia, precordial pain, palpitations, difficulty in micturition, muscular weakness and tenseness, anxiety, restlessness and insomnia. Many patients can present a toxic psychosis with delusions and hallucinations. Some may develop cardiac arrhythmias, circulatory collapse, convulsions, coma and respiratory failure. The Oral LD50 values for this combination product were greater than 525 and 1839 mg/kg in mice and rats respectively. may be valuable for their action in rapid dilution of bowel content. After emergency treatment, the patient should continue to be medically monitored. Treatment of the signs and symptoms of overdosage is symptomatic and supportive. Stimulants barbiturates, diazepam or paraldehyde may be administered to control seizures. Hyperpyrexia especially in children may require treatment with tepid water, sponge baths or hypothermic blanket. Apnea is treated with Ventilatory Support. Clarinase Repetabs Tablets are supplied in box 14 tablets (2 strips x 7 tablets). Store between 2°and 30°C. Protect from excessive moisture. Under authority of: Schering-Plough Corporation/U.S.A.